Celebrate National Pie Day with Marie Callender's - Giveaway - It's Gravy, Baby! Marie Callender’s Chocolate Satin Pie did not disappoint. It was delicious. The best part? It can be ready to eat in only seconds! Simply pop it in the microwave and in ten seconds, you are ready to dig-in. We don’t use a microwave, but you can also let them thaw out in the refrigerator. It takes a little longer (about 20-30 minutes), but this pie is worth the wait. 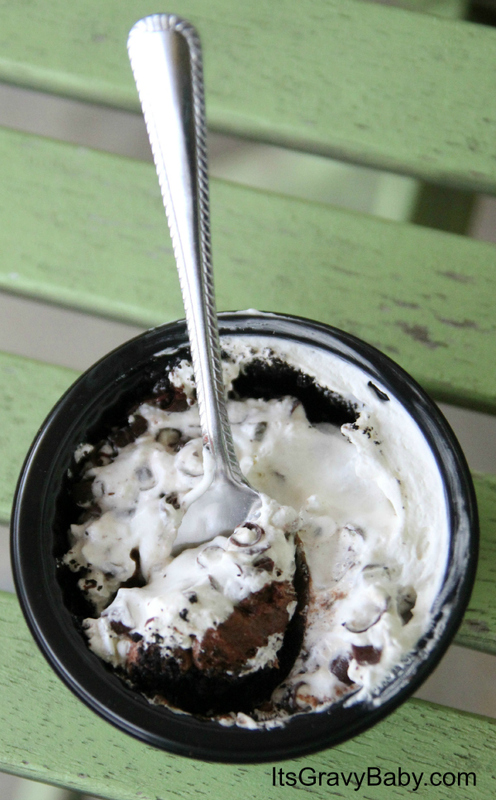 The cookie crumble crust, chocolate filling, and fluffy whipped topping mix together in bites of deliciousness. 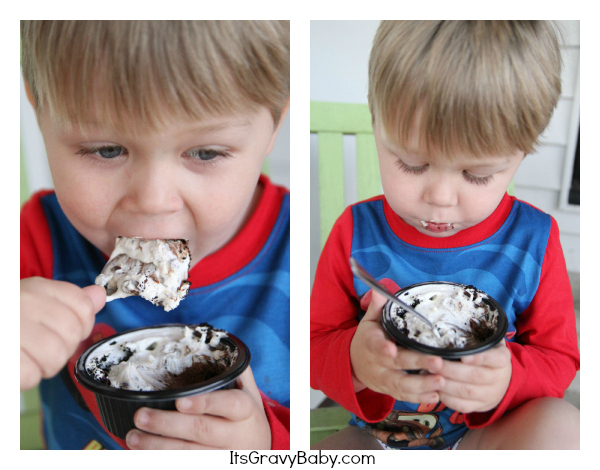 If you like chocolate pie, you have to give this a try! Which Marie Callender’s products are your favorite? You can leave a review at MarieCallendersMeals.com. I usually check reviews before a new purchase, so you can help others by reviewing your favorite Marie Callender’s foods. You can also visit the Marie Callender’s blog and let them know what kind of pie you are celebrating Pie Day with! The folks at Marie Callender’s want to help you celebrate National Pie Day too by giving one lucky winner a $25 VISA gift card! This is a Rafflecopter giveaway. If you are reading this via e-mail or feed, please click over to the post to enter and allow sufficient time for the form to load. Thank you! I like the dutch apple pie. Perhaps I am one of the few that have yet to try Marie Callender but the Chocolate Satin pie looks beyond wonderful. Marie Callender’s chicken pot pie is my favorite. I like the Chocolate Satin pie. Favorite – Three Meat and Four Cheese Lasagna. I like the chicken pot pie. Turtle Pie is a really good one. My favorite product of theirs has been the Chicken Pot Pie! I love her chicken pot pies… Nothing better when you’re not feeling well and don’t feel like cooking! I love their key lime pie! I love their savory pot pies. Wow! I didn’t know they made steamers, soups, or breakfasts! I’ve always liked their regular frozen entrees, but now I’ll be on the lookout for those items, too! I love their Chicken Pot Pies and their Chocolate Turtle Pies. i like their chicken pot pie, haven’t tried their desserts though, they look really good! I like the chicken pot pie. I also think that Chocolate Pie looks very good. I recently tried their peppermint cream pie and am now a fan! Oh I love the Cheesy Chicken and Rice! their pot pies are much better than any other frozen pot pie I have ever tried. I can’t wait to try it! It looks delicious! I’ve never tried any but I’d like to try the Turtle Pie. Haven’t tried their pies, but they are lasagnas are great. I love Marie Callender’s chicken pot pie, it’s so filling! I love the chicken pot pie from Marie Callender’s and their Chocolate Satin Pie is my favorite dessert. I like their Chocolate Satin pie. I love their pot pies! It’s a tie between apple and pumpkin pie, mostly depends on the season! I have never tried Marie Callendar’s pies, but the Key Lime sounds very good. I like the broccholi and chicken pot pie. Love the Chicken Pot Pies and also the Apple Lattice pie. The Razzleberry Pie is the best! My favorite is the chicken pot pie. The Fettuccini with Chicken and Broccoli is my favorite! We like their pot pies. I love their peanut butter pie! SOOOO good!! Thanks! I like their chicken pot pies. I’ve never tried their products but would love to! I love their pot pies! Chicken is the best, just like hommade. Me oh my I like pie. My favorite is the dutch apple pie. I would love to try the scrumptious sounding turtle pie. I have not tried any Marie Callender’s products, but my son did request I buy the chicken potpies a couple times. I would love to try this coconut cream pie. Shrimp Scampi – and it’s under 500 calories! My family really enjoys the Pot pies, and the chilli with cornbread. I like Marie Callendars pot pies. Love their Key Lime pie! We love her Chicken Pot Pie. I want to thank you for this awesome sweep and hope to win 🙂 Thanks !!! My family loves Marie Callender Pot Pies! I love the Chicken Pot Pie – makes for an easy and yummy meal! Love the chicken or turkey pot pies on a cold wintery night. I love the pot pies! Soo good! i love the chicken pot pie..ive not had any desserts from them. I love the Pecan Pie. I have had their apple pie and it is awesome. their turtlepie is so amazing! That Chocolate Satin pie sounds wonderful!! I would love Key Lime Pie. 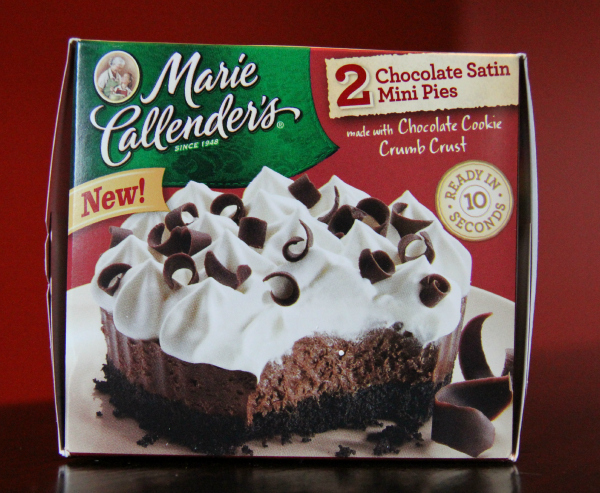 I have not found a Marie Callender product that i do not like and there Chocolate Satin pie is to die for and now they have it in a smaller version. Yum! I want to try the Key Lime mini pie. There’s actually a Marie Callenders restaurant here in town, haven’t been but need to go sometime soon! I LOVE the Chocolate Satin Pie! THe only pie I have had from Marie Calendar’s is a chicken pot pie and it was wonderful! I love all Marie’s pie, especially the Chocolate Satin Pie, but I always enjoy Marie’s Appetizer Combo Platter, great variety for a quick dinner for the kids. I like the chocolate satin pie the most!! My girls and I love these chocolate pies. We fight over who gets to eat them. lol Thank you! I love the chocolate pies. To be honest, I’ve never tried Marie Callender’s products before but the pies sound great. I love Marie Calendar’s Key Lime pie. I like their key lime pie. My favorite is the Peanut Butter Pie. It’s so good. the french silk pie is my fav! My favorite product would be the chocolate silk pie. i absolutely love chocolate cream pie or was it french silk? everything of theirs is amazing. I like almost every Marie Callender product that I’ve tried. I love their products. I do like he Key Lime Pie a lot! I like their Coconut Cream pies. My favorite is the Coconut Cream pie. I really love their pot pies! I have yet to try their pies, but I love their chicken pot pies! My favorite Marie Callender product is their Meat Lasagna! Tastes just like homemade! I am a huge fan of the chicken pot pie! Marie Callender’s Chicken Pot Pies are the best ever!! I love Marie Callender’s pot pies – especially the Chicken & Turkey! I love the apple pie! We adore the chicken pot pies. I love the tv dinner, they are so good! I like the chicken pot pies the most. one fav is the lemon meringue pie. Simply out of this world! I love all of their pot pies! I love the little small apple pie. I love the cheese stuffed pasta! It’s low calorie and soooo good! I’m often just having dinner for one, and this is perfect and so good, my Italian grandmother would approve! Leave a review of and/ or tell about your favorite Marie Callender’s product. Marie Calendar’s has a TV dinner bowl with parmesan steak and pasta. It rocks. I’ve only had their pot pies, but this looks delish! I love the Marie Calendar pot pies! I like the Turkey Pot Pies. Thanks. The chicken pot pies are the best pot pies I’ve ever eaten. We’re big fans of the Chicken Pot Pie. i’m all about key lime!!! Sorry to say but I have never tried Marie Callenders items. My favorite is the lasagna–just the right size to keep in the freezer for a quick meal for 2. I have not yet tried any of their products but I’d like to try the pot pie. I like their pot pies. We usually have several different varieties in our freezer at any given time. I like the chicken ones the best. Love that the crust gets nice and crunchy without burning! Their apple pie is the only apple pie I will eat. These look delicious! Might have to make a run for some! I love their regular pecan pies! Amazing. LOVE the dutch apple pie put out by marie calander Y U M! I luv the coconut cream mini pie! Nothing can satisfy cravings like having this partially frozen! Yum! I missed this one. Love Marie calendars. My family likes the chocolate satin pie. i love her chicken pot pies, i havent tried her desserts yet. I love the Chicken Pot Pies. I love the small single serve apple pie. The crust is wonderful. i love their lemon meringue pie! yum! I have not tried Marie Callender Pies but the Banana Cream Pie on their site looks delicious. I love the Fettuccini Alfredo! There family meals are amazing! I like the Key Lime Pie. Thanks for the giveaway… we like the Very Berry Blackberry Pie ! I love the Mac and Cheese! The Lemon Meringue Pie is my favorite. It is delicious. I love their chicken pot pie. The last pie I purchased from them was lemon meringue and my family loved it. I haven’t tried any Marie Callender’s products yet. I love the Dutch Apple! The apple pie is my favorite. My favorite item is Marie Callenders Razzleberry Pie.